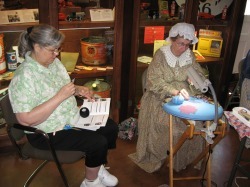 The purpose of Lacemakers Guild of Oklahoma (LGO) is to promote, study, and foster a public interest and appreciation of all aspects of the art of lace and lace making. Since 1992 we have promoted lace making through monthly meetings, educational programs, demonstrations, and instruction. Membership in LGO is $15/calendar year. Members receive bi-monthly newsletters, participate in monthly programs, and have access to the LGO library of lacemaking books, magazines, videos, and other materials. We are located in Bartlesville, Oklahoma, an hour north of Tulsa.